During the 2017-18 school year, SIUE will remain in the Southern Conference in wrestling, where the Cougars have competed since 2013. “Joining the Mid-American Conference as an affiliate member in these two sports is not only a compliment, but also a recognition and validation of each program’s recent success,” Hewitt said. “We are thankful for the opportunities granted and support given by the Missouri Valley Conference in men’s soccer and the Southern Conference in wrestling. SIUE men’s soccer is coming off its most successful season since its return to NCAA Division I competition in 2008. The Cougars won their second MVC tournament championship before advancing to the Sweet 16 of the NCAA College Cup during the 2016 season. SIUE dispatched No. 13 Michigan State and No. 11 Butler on its way to the third round, where the Cougars fell to eventual runner-up Wake Forest. The Cougars finished the year with a 10-5-7 record, marking the second consecutive year SIUE finished with at least 10 wins and the third double-digit win season in the past five years. The Cougars enjoyed a 14-game unbeaten streak from Sept. 28 until the loss to Wake Forest. SIUE finished at No. 5 in the NCAA in save percentage (.845) and 16th nationally in goals against average (0.71). The Cougars led the MVC in attendance and were 41st nationally with an average of 846 fans per contest. The 2016 College Cup appearance marked SIUE’s 15th appearance in the NCAA Division I championship and the 23rd NCAA tournament appearance overall. SIUE won an NCAA Division I National Championship in 1979. The Cougars were national runners-up in 1975, finished third in 1977 and were national semifinalists in 1982. SIUE also captured the College Division National Title in 1972, was runner-up at the Division II level in 2004 and a semifinalist in 2005. With the addition of SIUE, the conference will consist of six men’s soccer programs – four from full MAC membership (Akron, Bowling Green, Northern Illinois and Western Michigan) and two affiliate members (SIUE and West Virginia). SIUE wrestling also is fresh from one of its best seasons since the move to Division I. Three SIUE wrestlers won their respective weight classes at the Southern Conference championship and advanced to the NCAA championships in St. Louis. Senior Jake Residori finished in eighth place, becoming SIUE’s first All-American in 30 years. The Cougars enjoyed their most successful season in the SoCon, collecting 69.5 points to finish third at the 2017 championship. The third-place finish followed the Cougars’ best-ever regular season finish at 4-3. “The SoCon is a growing conference, and we were happy to be with them, and they'll continue to do well,” SIUE wrestling Head Coach Jeremy Spates said. “The MAC is an extremely strong conference across all sports, and in wrestling it’s one of the top three or four conferences. SIUE wrestling owns a rich history. The Cougars have three NCAA Division II team national championships and have earned nine other top-four finishes. SIUE also claims 19 NCAA Division II individual national champions. Residori’s eighth-place finish in 2017 gave SIUE 12 NCAA Division I All-Americans, while the school boasts more than 110 Division II All-Americans. 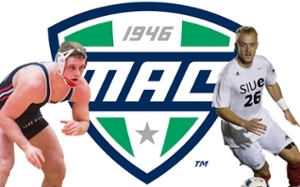 The MAC will consist of nine wrestling programs – six from full MAC membership (Buffalo, Central Michigan, Eastern Michigan, Kent State, Northern Illinois and Ohio) and three affiliate members (Missouri, Old Dominion and SIUE). The move to the MAC marks just the second conference home for wrestling, and the first time that men’s soccer and wrestling will share a conference.